Leonardo da Vinci and Michelangelo Buonarroti are coming to town. Well, not exactly. 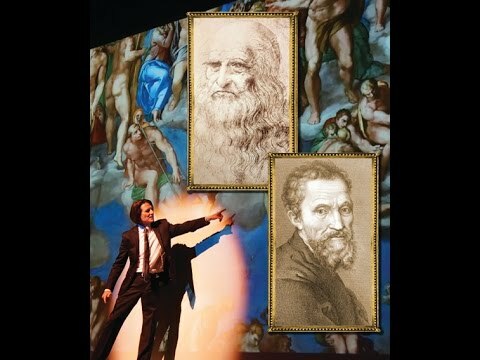 But da Vinci and Michelangelo expert Mark Rodgers of Genius Productions Foundation will bring his interactive multimedia performance lecture to the Salida SteamPlant at 7 p.m. Wednesday, Aug. 9. Rodgers saw an opportunity to take his docent talks to the next level, so he combined both of the Renaissance geniuses into the tours and highlighted their competitiveness. “They hated each other; they were total opposites. The more I found out, the more I wanted to know and the more interesting it became.” As the crowds continued to grow, Rodgers considered the option of taking the show on the road, offering a multimedia presentation that didn’t require transporting two tractor-trailers full of displays. “My first performance was in the dome at The South Florida Museum; it sold out in 10 minutes. Da Vinci and Michelangelo have a draw that people are hungry for. Their back story is fascinating, and it still applies to us today.” Today, the show has evolved into a performance that Rodgers wraps up by zeroing in on modern-day geniuses, including such musical brainiacs as Les Paul, Van Cliburn and Paul McCartney. “The whole theme of our show is to discover the da Vinci new,” Rodgers explained. More information is available at DiscoverDaVinci.com. Tickets for Da Vinci & Michelangelo: The Titans Experience cost $17 in advance or $19 at the door. Tickets may be purchased at the SteamPlant box office or online at SalidaSteamPlant.com.